Hampi (Kannada: ಹಂಪೆ, Hampe) refers to a village in northern Karnataka. The name "Hampi" comes from the anglicized version of the Kannada Hampe (derived from Pampa, the ancient name for the Tungabhadra river). Over the years, it has also been referred to as Vijayanagara and Virupakshapura (from Virupaksha, the patron deity of the Vijayanagara rulers). Hampi, located within the ruins of Vijayanagara, served as the capital of the Vijayanagara Empire. Possibly predating the city of Vijayanagara, the village continues as an important religious center, housing the Virupaksha Temple. The village of Hampi contains several other monuments belonging to the old city. It extends into some of the old ceremonial streets of Vijayanagara. Standing at the original center of Vijayanagara, people sometimes confuse the village with this ruined city. Hampi also goes by the name "The City of Ruins." UNESCO has designated the Vijayanagara ruins as a World Heritage Site within the Group of Monuments at Hampi title. A Hindu temple naga decoration at Hampi. Hampi identifies with the mythological Kishkindha, the Vanara (monkey) kingdom which finds mention in the Ramayana. 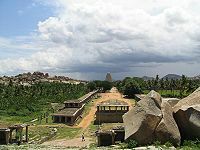 The first historical settlements in Hampi date to 1 C.E. 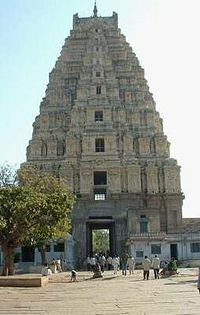 Hampi formed one of the centers of the capital of the Vijayanagara Empire from 1336 to 1565. Muslim emperors destroyed it. The founders of Hampi selected the site for its strategic location, bounded by the torrential Tungabhadra river on one side and surrounded by defensible hills on the other three sides. In terms of architecture and history, the site has immense significance. Abundant large stones had been used to create life-like statues of gods. Structure of historic importance stand every quarter of a mile. Sadly, the city stands in ruins, a testimony to the Islamic ravages of the sites. The conquerers considered the statues at Hampi idols, destroying or damaging all of them. Successive governments have been unable to protect the site from looters and treasure hunters, who cause further damage. The Archaeological Survey of India has conducted continuous excavations of the site to discover more artifacts and temples. Hampi sits on the banks of the Tungabhadra river, 353 km from Bangalore, 254 km from Bijapur, and 74 km away from Bellary. Hospet, the nearest taluka headquarters, sits 13 km away. The majority of the people speak Kannada. 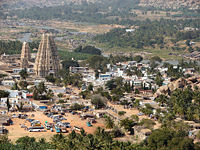 Agriculture, the support of the Virupaksha temple and other holy places in the vicinity, and tourism represent the principal pillars of the village's economy. The government of Karnataka organizes the annual Vijayanagar Festival in November. Mining rich deposits of iron-ore and manganese provides work and brings money into the region. A recent increase in demand for iron-ore internationally has led to excessive mining in the district. The World Heritage Site at Hampi, as well as the Tungabhadra Dam, have been endangered by the excessive mining. 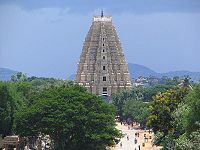 Virupaksha Temple represents the main center of pilgrimage at Hampi and has been considered sacred over many centuries. Fully intact among the surrounding ruins, devotees still use the temple for worship. The temple has been dedicated to Shiva, known here as Virupaksha, the consort of the local goddess Pampa, associated by local mythology with the Tungabhadra River. The temple has an uninterrupted history from roughly the seventh century C.E. The Virupaksha-Pampa sanctuary existed well before the the Vijayanagara capital located here. Inscriptions referring to Shiva date back to the ninth and tenth centuries. What started as a small shrine grew into a large complex under the Vijayanagara rulers. Evidence indicates there were additions made to the temple in late Chalukyan and Hoysala periods but most of the temple buildings are attributed to the Vijayanagar period. Under the Virjayanagara rulers early in the twelfth century, native art and culture flowered. When invaders defeated those rulers in the sixteenth century, they systematically destroyed most of the magnificent decorative structures. The cult of Virupaksha-Pampa survived the destruction of the city in 1565. Worship at the temple has continued throughout the centuries. At the beginning of the nineteenth century, the temple underwent major renovations and additions, including ceiling paintings and the towers of the north and east gopura. The nine-tiered eastern gateway, the largest at 50 meters, was a well-proportioned construction, incorporating some earlier structures. It has a brick superstructure and a two-tiered stone base, giving access to the outer court containing many sub-shrines. The smaller eastern gateway leads to the inner court with its numerous smaller shrines. A narrow channel of the Tungabhadra River flows along the temple's terrace and then descends to the temple-kitchen and out through the outer court. Krishnadevaraya, one of the famous kings of the Vijayanagara Empire, had been a major patron of this temple. Many believe that he commissioned the most ornate of all structures in the temple, the central pillared hall. Likewise the gateway tower giving access to the inner courtyard of the temple. Inscriptions on a stone plaque installed next to the pillared hall cite his contribution to the temple, recording that Krishna Devaraya commissioned the hall in 1510 C.E. The temple continues to prosper and attracts huge crowds for the betrothal and marriage festivities of Virupaksha and Pampa in December. In the month of February, the annual chariot festival celebrated here draws enormous crowds. ↑ UNESCO, Group of Monuments at Hampi. Retrieved December 20, 2006. ↑ University of Pennsylvania, Virupaksha Research Project. Retrieved September 13, 2006. ↑ hampionline, Shri Virupaksha Temple. Retrieved September 13, 2006. ↑ Hotel Skarnataka, Virupaksha Temple. Retrieved September 13, 2006. ↑ Templenet.com, Virupaksha Temple at Hampi. Retrieved September 13, 2006. ↑ Hampi.in, Details of Virupaksha Temple. Retrieved March 8, 2007. Satyan, T.S. Hampi: The fabled capital of the Vijayanagara Empire. Govt. of Karnataka, 1995. Group of Monuments at Hampi - UNESCO page. 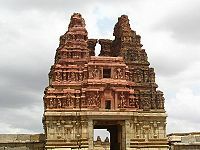 A website dedicated to info on Hampi. This page was last modified on 26 July 2017, at 16:28.